Carl Neracher was born to make the Ner-A-Car; it was his name, after all! That double pun – his motorcycle was both ‘nearly a car’ and a mis-spelling of his name – was auspicious wordplay, for while his 1918 design was only built for seven years (from 1921-28), it sold very well, with a combined 16,500 units built in both US and British factories. 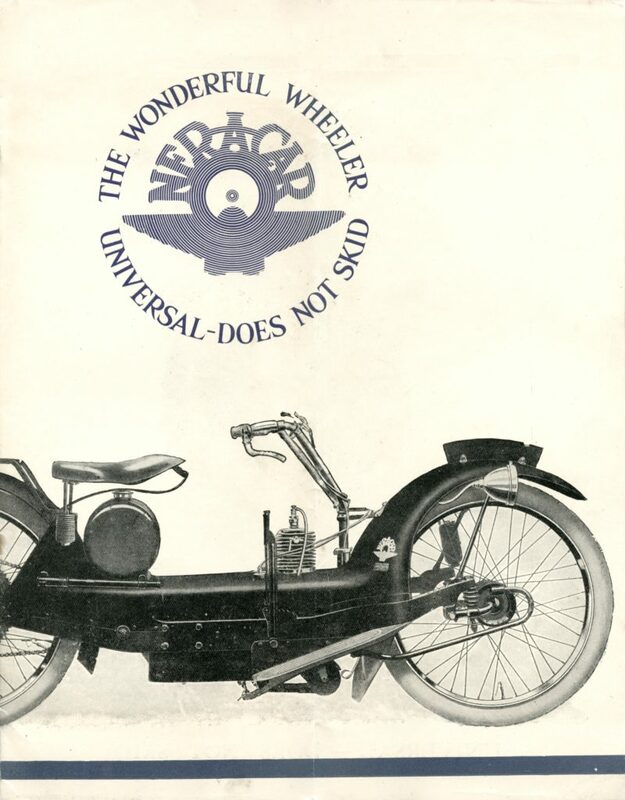 The Ner-A-Car remains the most successful hub-center steered motorcycle ever built, far eclipsing the sales of similarly constructed machines from the 1905 Zenith Bi-Car (not many built!) to the Bimota Tesi of 2008 (417 produced). 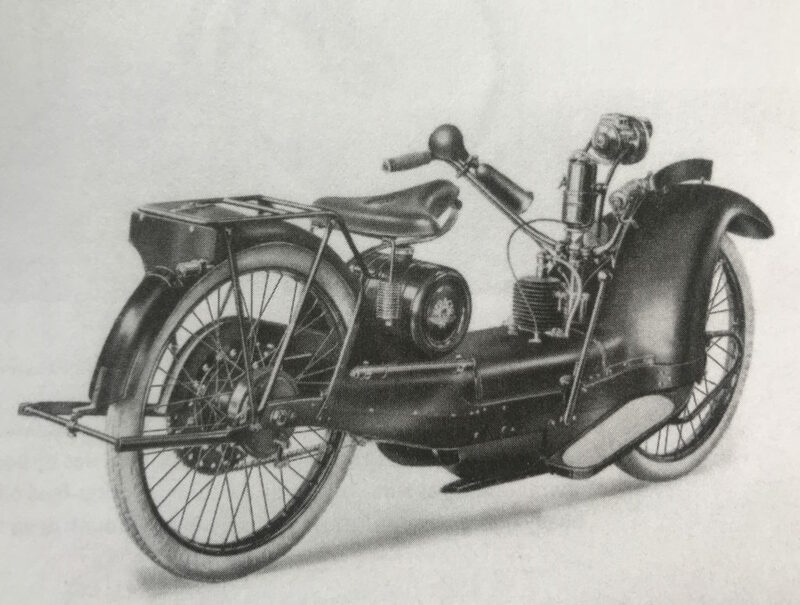 Carl Neracher designed his radical hub-center steered motorcycle in 1918, right after WW1, and it was designed from the start to feature a car-type chassis and fully enclosed bodywork that protected the rider from road grit. It steered with the same mechanism as an automobile, and offered much the same protection, so it was indeed ‘Ner-A-Car’, as it was sold in Britian; in the US, it was sold as the ‘Neracar’. 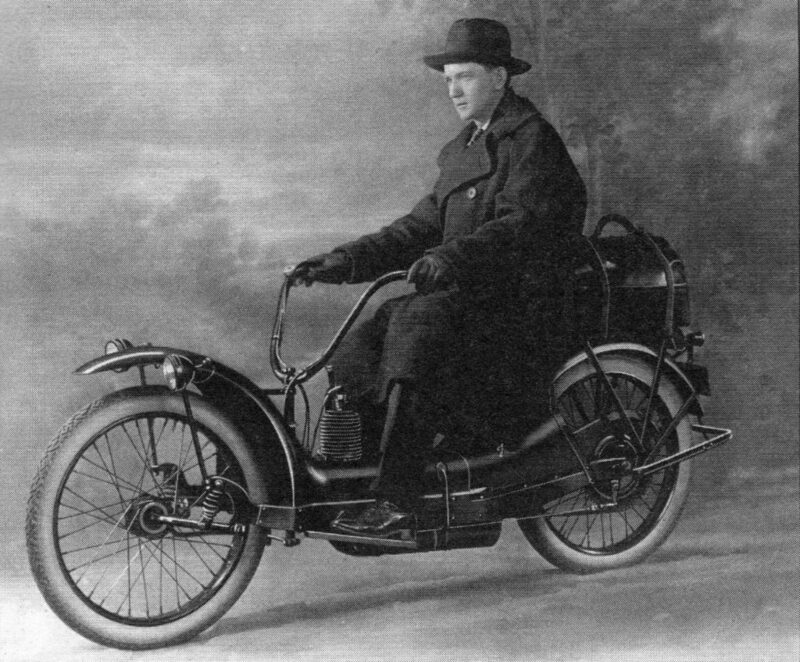 Carl Neracher (1882-1962) first emerged on the motor vehicle scene as a sales rep for the Smith Motor Wheel Co, that produced an auxiliary motor attachment (fixed on a third wheel) for bicycles. He was next the Chief Engineer for the Cleveland Motorcycle Mf’r Co, reportedly designing their distinctive lightweight two-stroke single, with a cross-ways (transverse) mounted engine, that necessitated a 90deg bevel-drive to complete the transmission with a chain. 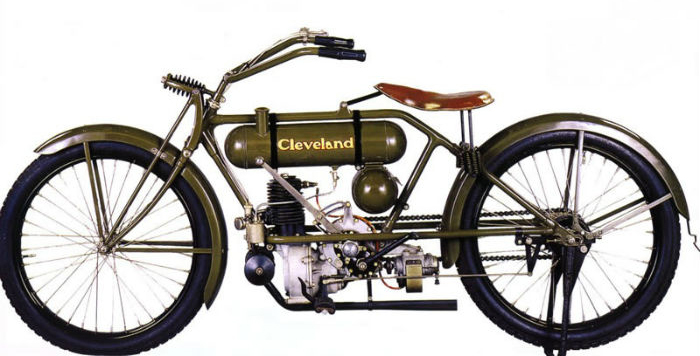 The little Cleveland had some sales success, and was used by the US Army as an on-base courier machine during WW1. The Cleveland’s 221cc transverse two-stroke single-cylinder motor would reappear in the Ner-A-Car a few years later. Carl Neracher didn’t invent the Neracar in a vacuum: hub-center steering had been in production since at least 1904, in Britain with Tooley’s Patent Bi-Car, which the Zenith company licensed and sold at the Bi-Car from 1905. The Bi-Car used a low-slung tubular chassis with its hub-center steering, but in the US, the Militaire of 1911 used a C-section sheet steel frame very similar to the Ner-A-Car, which held the front wheel between extended chassis arms. Strangely, neither of these machines was referenced in a Patent plate affixed to the Neracar chassis in the US; it credits patents granted to John J. Chapin of the Detroit Bi-Car Co. of 1911. 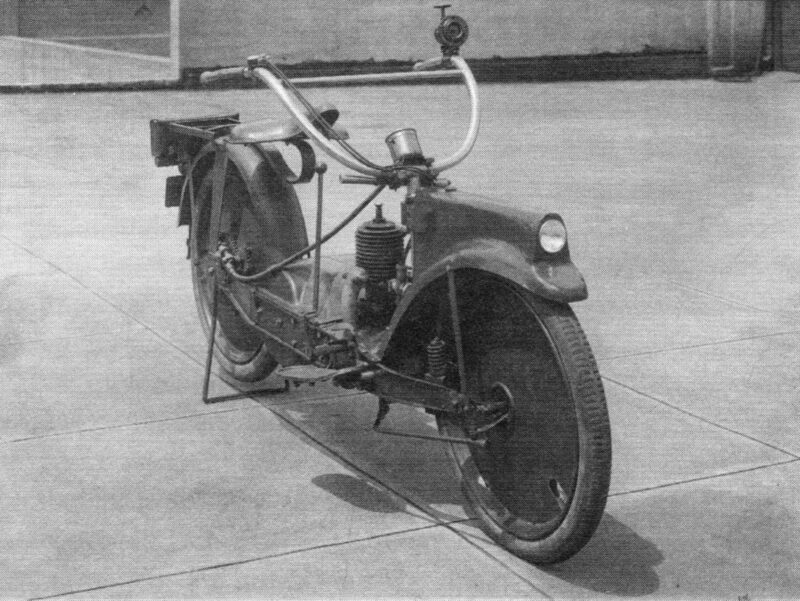 According to a 1911 edition of The Bicycling World, the Bi-Car was “an attempt to construct a two-wheel vehicle embracing many desirable features of the automobile.” Which principally meant protection from road muck for the rider, and stability on the road, in an era when motorcycles handled terribly, with very high centers of gravity, and zero understanding of using rake/trail adjustments in combination with a suitable wheelbase and good weight distribution to achieve stability. Compared to any other machine on the road in 1911, a hub-center steered motorcycle must have been a revelation, as they’re stable to the point of being safe to ride hands-off. 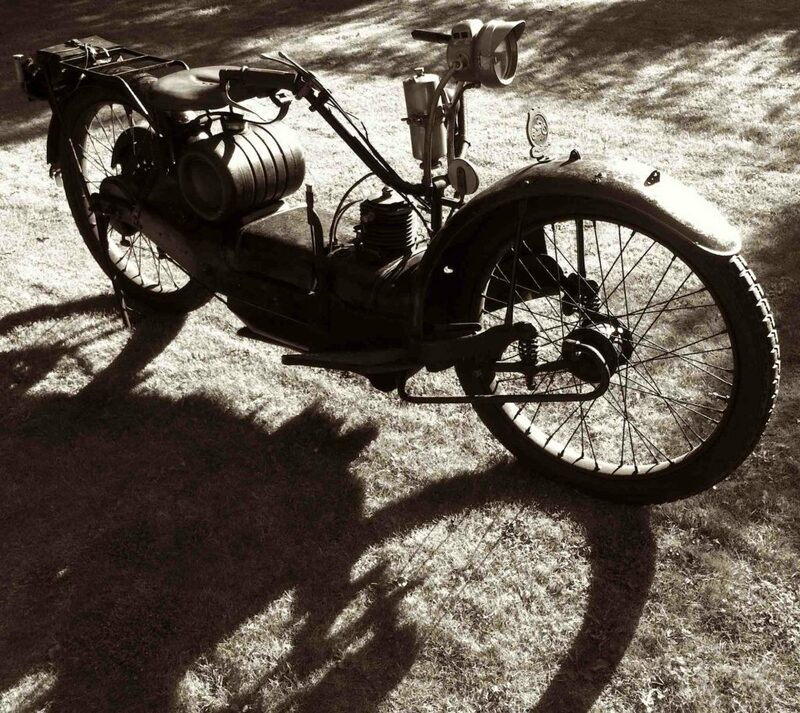 In the immediate aftermath of WW1, aircraft factories like Sopwith, Bleriot, BMW, and Sheffield Simplex found themselves without orders, turning to motorcycles to keep their factories occupied. Motorcycles offered similar requirements for technical sophistication in manufacture, and offered a degree of panache/danger that seemed a natural fit for an aircraft firm. Sheffield-Simplex manager H.H. Powell was coaxed by J. Allan Smith (Carl Neracher’s business partner) to visit the USA and assess their new design in early 1919. 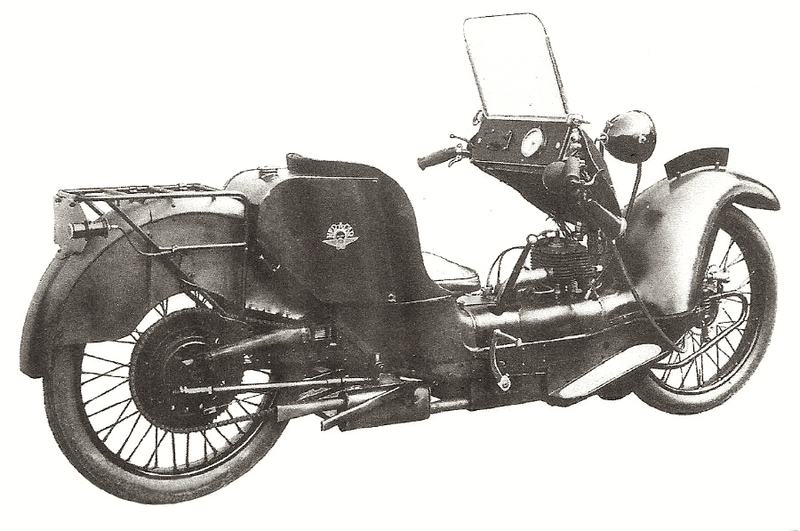 Sheffield-Simplex’s rival Sopwith Aviation had already committed to production of the flat-twin ABC motorcycle by 1919 (designed by Granville Bradshaw and the equal in radicality to the Neracher’s design), which may have encouraged Powell to take out a license to produce Neracher’s design in Britain. In late 1919, the Inter Continental Engineering Company was formed in London, with Board members including many Sheffield Simplex executives, plus J.Allan Smith and Carl Neracher, and H.H. Powell himself. Sheffield Simplex set up a factory for motorcycle production in Tinsley, near Sheffield, with a second assembly plant at Finningley, near Doncaster. The Ner-A-Car, as it was called from its 1921 press announcements, was slightly altered from Neracher’s blueprints, and the introductory engine was a Sheffield Simplex two-stroke single of 221cc. 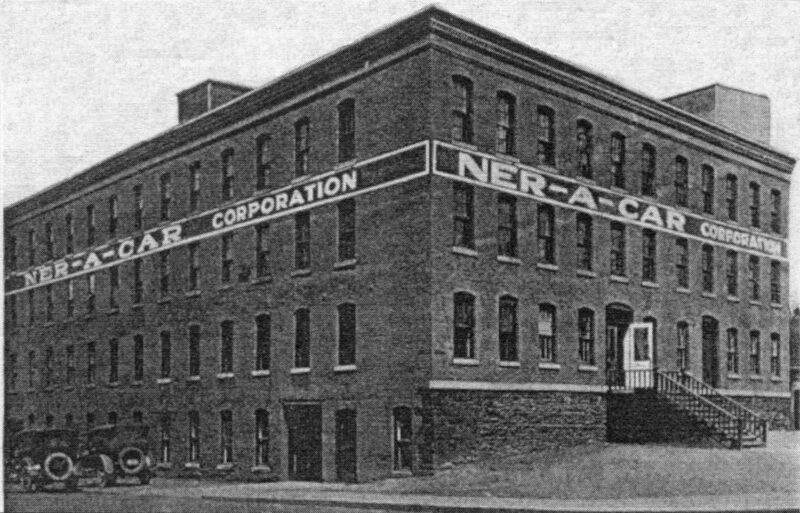 In the US, the Ner-A-Car Corporation was formed in late 1921 with financial backing secured domestically, and a factory set up at 196 S. Geddes Street in Syracuse. NY. 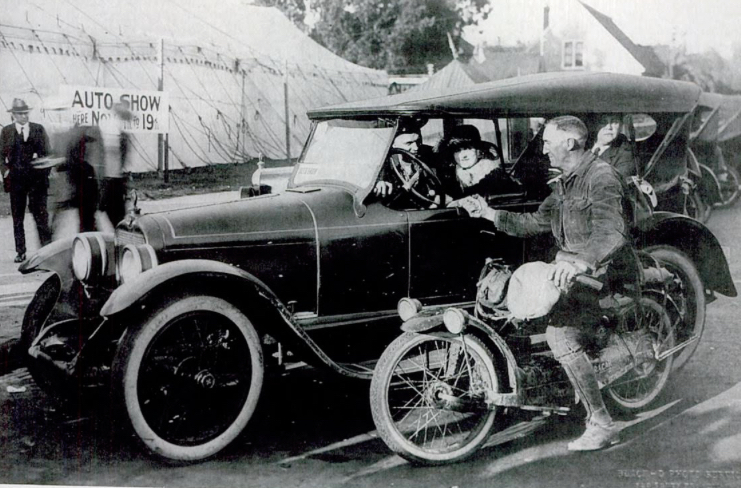 The first appearance of the American ‘Neracar’ was at the Chicago National Motorcycle, Bicycle and Accessories Show in late 1921. 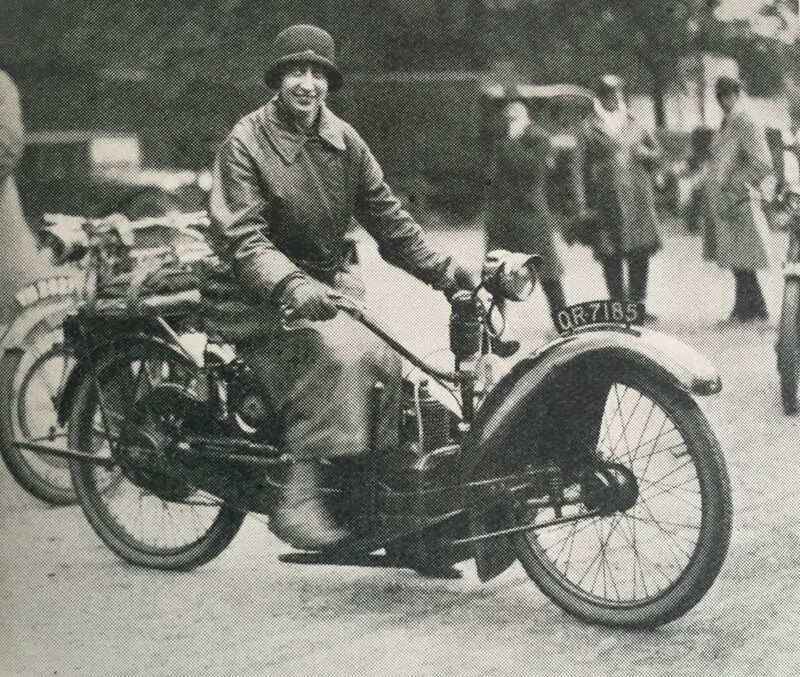 In 1921, Gwenda Janson makes an observed 1,000-mile ride to gain an ACU Certificate, and she gained a second Certificate in December that year for a non-stop ride of 300 miles. 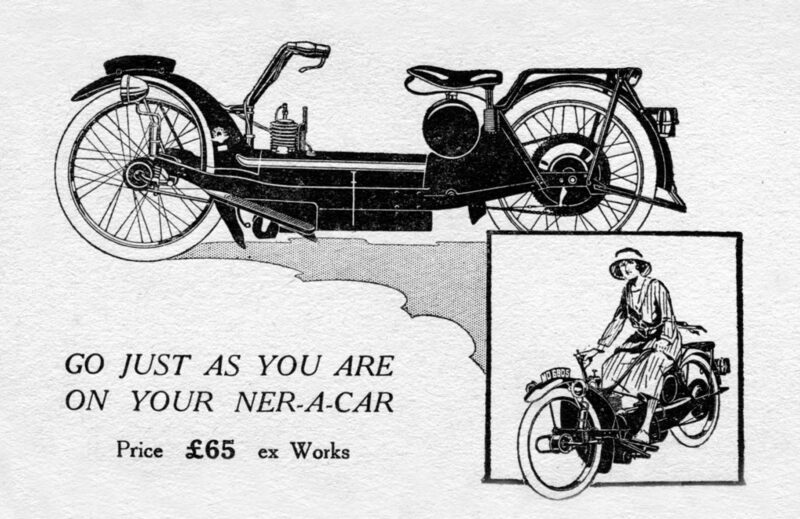 With its full enclosure, easy starting, and very stable ride, the Ner-A-Car was heavily marketed to women riders, and their advertising and brochures make an emphatic appeal to ladies, who had only very recently gained the right to vote in both the UK (1918) and the USA (1920). 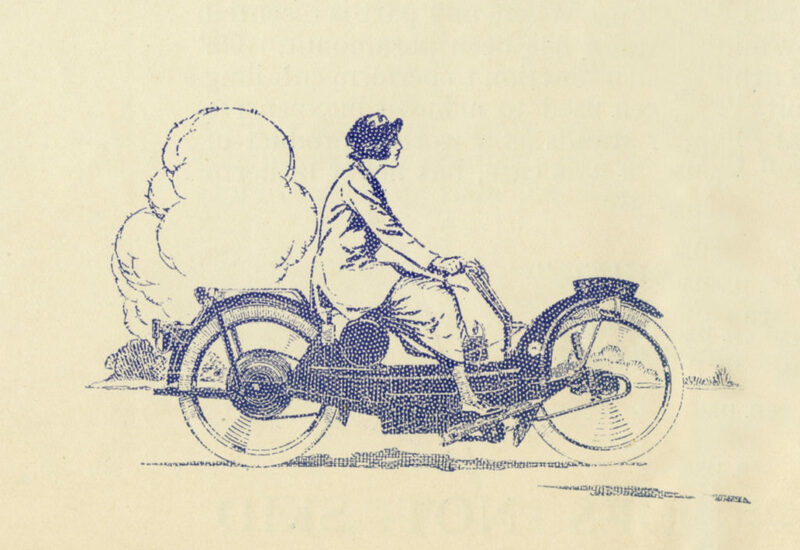 It was an era when motorcycle factories in the UK and Europe made direct appeals to women riders in brochures and advertising, and built ‘Ladies’ Models’ – similar to Ladies’ Bicycles – to accommodate their clothing styles, before women wearing trousers became commonplace. In that sense, Ner-A-Car catered to a feminist revolution, supporting women’s identity as independently mobile individuals, whose competence mastering a motorized vehicle was unquestioned. This my seem normal today (except in Saudi Arabia), but the early 1920s was still the Victorian era, when women’s social roles were extremely restricted, as were their property rights, and of course their right to vote. In November of 1922, ‘Cannonball’ Baker rode a Neracar across the USA, traveling from New York to Los Angeles, a trip of 3364.2 miles, in 27 days, 5 hours, 28 minutes, using 45 gallons of gasoline and 5 5/8 gallons of oil, at a cost of $15.70. He averaged 19.41mph over the horrific unpaved ‘roads’ of the day, and averaged 74.77mpg. Baker had a few things to say about the Neracar, and was quoted in a 1960s interview, “I have ridden a lot of fine handling motorcycles in my day, but I NEVER RODE ANYTHING that would come so near to steering itself as a Neracar. A popular demonstration of this Neracar by dealers and salesmen who sold it was to stand up on the footboards, ride it over rough roads, with hands behind their backs. 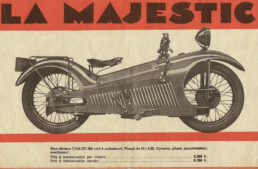 I have pictures of Neracar riders standing in the saddle, other kneeling on the saddle with their hands locked in handcuffs.” The word on the street, in the press, and in the ads proclaimed the Neracar as the most stable motorcycle ever built. Press response was very positive among reviewers. 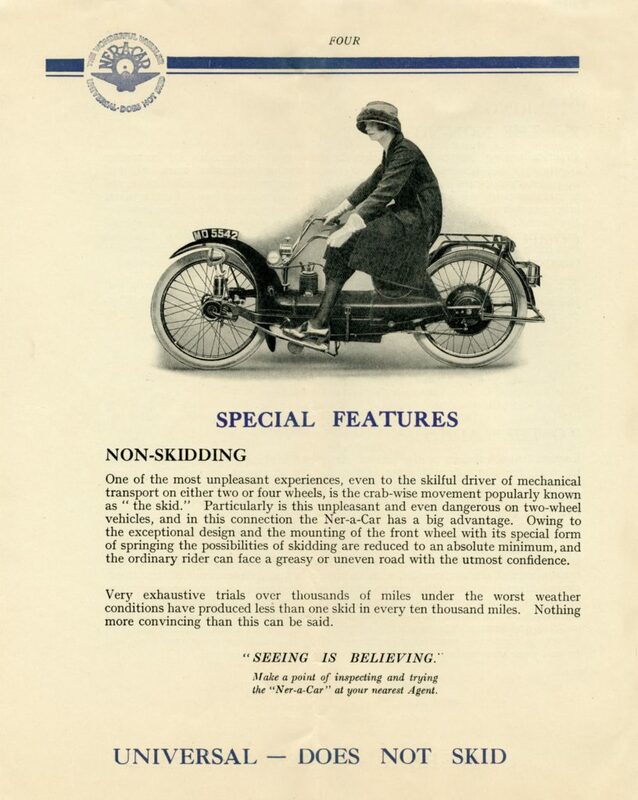 In the Spring of 1922 Motorcycling and Bicycling featured a road test of a Neracar by LE Fowler, who was impressed by the bike’s easy handling, and how clean the bike remained over muddy roads. After familiarizing himself with the machine on a trip from Syracuse to Auburn NY, he rode the Neracar standing on the footboards, with no hands. By 1923, the English Ner-A-Car Model B got a larger motor (now 285cc), which gave a little more power, and the carburetor was moved to a more convenient location. The next year the Model C offered a Blackburne sidevalve engine of 350cc, which abandoned Neracher’s original friction-drive system (that gave a kind of ‘automatic transmisson’) in favor of a conventional clutch/gearbox/chain drive. 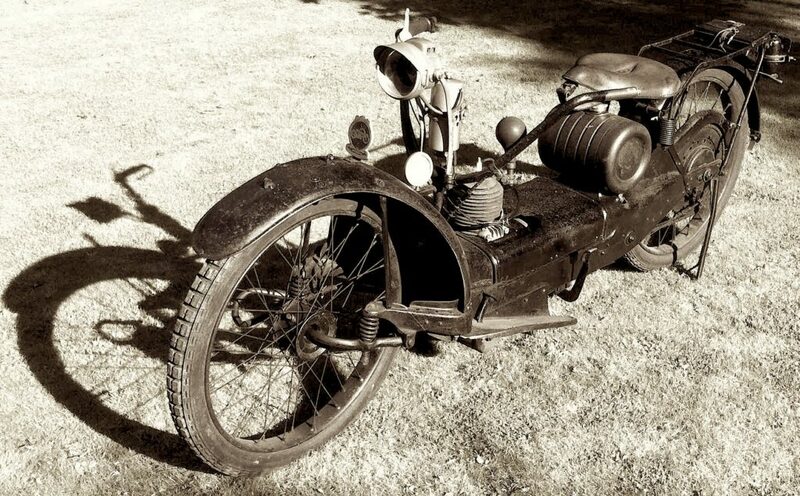 In 1925, Ner-A-Car upped the ante even further, offering a 350cc OHV Blackburne engine for the Model C. As the front hub was unchanged, there was no front brake, and the dual rear-wheel brakes of the Ner-A-Car would have been sorely tested by an 80mph motorcycle, although the chassis was quite capable of handling the speed. A further model was offered with rear springing and a car-type seat (shades of the Wilkinson), but by 1927, British production was finished, after 6500 machines were built. The American Neracar started out with a 221cc motor, which was increased to 255cc in 1924, and the original chassis configuration with friction drive was retained throughout the run of 10,000 machines. Over time the engine got better cooling fins, larger springs for the front suspension, a one-piece crankcase for better gas (and oil) sealing, and the carburetor was relocated to the left side of the engine, providing better access to the carb, and helping the intake mixture stay cooler. Options like balloon tires and carriers were available, and a second rear brake was added as required in most markets. Both Ner-A-Car factories struggled as the ’20s progressed and motorcycles became more competent, and many more small machines became available. The Ner-A-Car was a bright idea that had had its day, and without significant further development to keep up with the times (which might look like the Majestic? ), sales faded. Production figures, while the highest for any hub-center motorcycle in history, were still far less than the factories were capable of producing, and expected to produce. 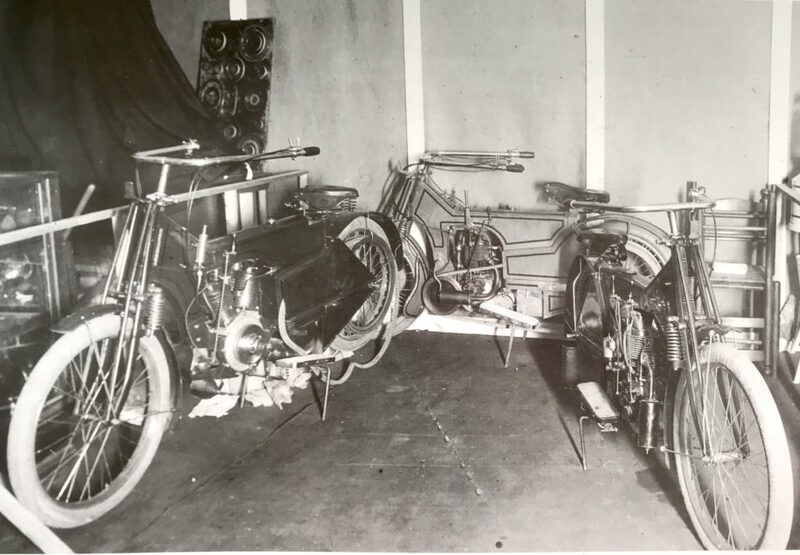 Radical or ‘better’ ideas have rarely been wildly popular in motorcycling, although most factories have tried one or two in their history – Wankel motors, hub-center bikes, fully enclosured bodywork, feet-forward riding positions, etc. None have proved to be big sellers, not even something as mundane as a 4-cylinder motorcycle, which the American industry proudly produced from 1909 onwards, with no profitability for any 4-cylinder manufacturer (Henderson, Indian, Ace, Cleveland, Militaire, Pierce, etc). It took the Ariel Square 4 (1931), and then the Honda CB750(1968), to prove a Four could be profitably sold. 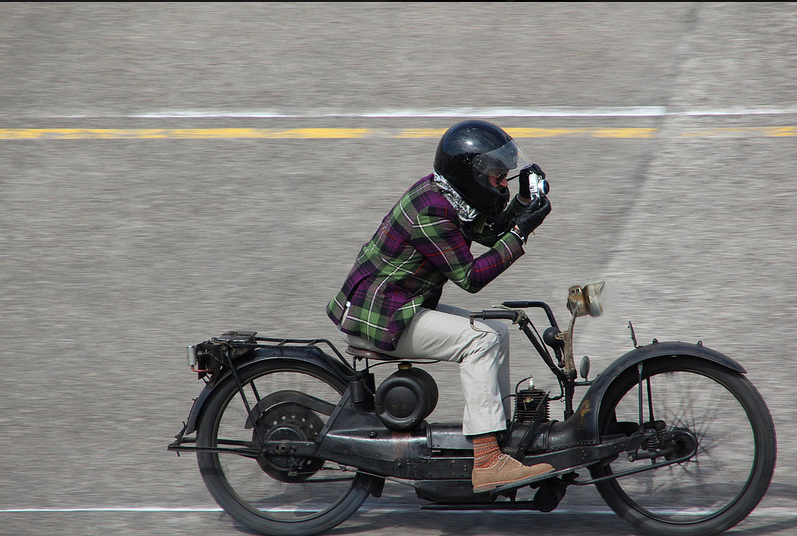 Although I’d seen quite a few Ner-A-Cars in museums and at motorcycle shows, I’d never seen one actually ridden until I was presented with a test machine, at the Vintage Revival Montlhéry event of 2013. The original-paint, oily rag machine was the property of Jon Dudley, who’d purchased it while searching for ‘something unusual’. He certainly got it, although of course the clergymen and nurses who were the Ner-A-Car’s primary customers in the UK didn’t mind, and appreciated not getting their clothes filthy during a ride to work. That function would be classified as ‘scooter’ today, and in some ways the Ner-A-Car fits the definition, barring its exceptional handling. Pushing the bike around with a dead engine doesn’t inspire confidence, with a wiggly feel transmitted between the front wheel and handlebars, which had the earlier, simpler linkages, which were replaced with ball joints on later models. But no matter, once the carb is tickled, one steps on a starter pedal mounted just behind the left side footboard, in the manner of an early BMW. With only 221cc, it’s an easy start with a decent spark from the flywheel magneto, hidden within the very housing that drives the friction wheel and hence the rear wheel – true design economy. An easy press down and the motor is soon pop-popping away underneath that bodywork, while the exposed cylinder top heats up. Fuel mix is controlled by a lever throttle on the right handlebar (with an air lever for starting), and on the left ‘bar is a twistgrip (funny they didn’t use one for the throttle!) which dis/engages the flywheel friction drive. There isn’t actually a clutch, but the twistgrip disengages the friction wheel from the flywheel that drives it. With no gears and no clutch plates, engaging the drive is more akin to a lever-pull automatic transmission, starting with the long ‘shift’ lever in low, and pushing through the five notches on the lever gate to ‘high gear’, at which point you’re north of 30mph. Ner-A-Car didn’t like top speed quotes, and the Board actively sought to keep top speeds DOWN to reduce intimidation for new riders, but the two-stroke version of the Ner-A-Car is good for 35mph, which can apparently be maintained ad nauseum. 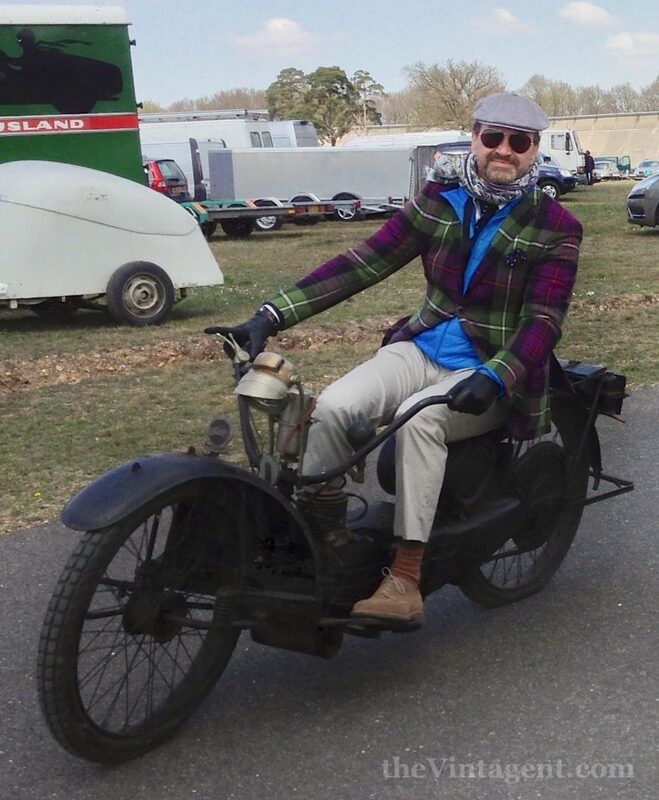 Such was my experience anyway, as I burbled onto the steeply-banked historic autodrome, and pulled the lever all the way to the ‘bar, and the speed lever all the way forward. A muted two-stroke howl and a stately pace soon led to a realization that my hands were no longer required on the ‘bars, and so I commenced to take photos of all the other riders passing me by, as I hugged the inside of the course. Even through the chicanes set up to bring riders off the banking and slow them down, the Ner-A-Car needed no assistance, only a shift in weight to arc through the curves, and so I carried on that way…for 3 full laps of the circuit! There’s no rear suspension, so Montlhéry’s notoriously bumpy concrete surface was felt through the sprung leather saddle, and although the front end did bounce gently over the worst of it, the plot never wavered from straight ahead. Such is my experience with every hub-center steered motorcycle I’ve ridden – absolute stability, at the expense of agility. The Ner-A-Car, being light, relatively small, and underpowered, never felt sluggish in steering or stubbornly unwilling to change direction, but was easy-peasy to ride around the paddock and even turn in fairly tight circles. The Ner-A-Car is a bike to inspire confidence in any rider, especially novices, with its stability and ease of use. 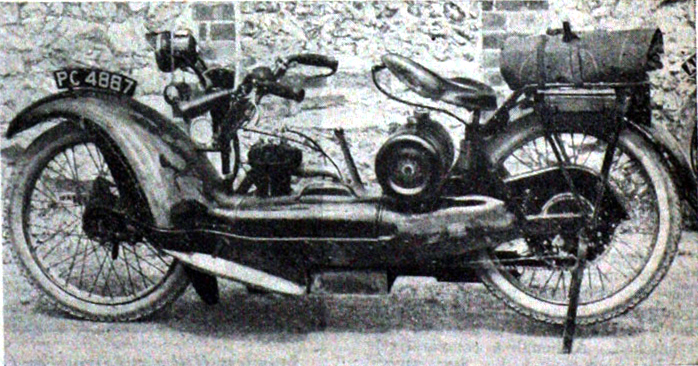 The Ner-A-Car was a noble attempt to provide a machine that fills the niche of the scooter, combining weather protection, ease of use, and a feet-forward riding position. It would take another 25 years before the scooter would be perfected by Piaggio and Innocenti, but for fans of unique engineering, the Ner-A-Car is an intriguing proposition. The Motorcycle Industry in New York State [referred to as TMIINYS above], 1999, Geoffrey Stein, NY State Museum, Albany. This is a remarkable book, and the only one of its type about American motorcycle production. In Europe, there are dozens of such books, such as Bernard Salvat’s ‘600 Marques Motocyclettes de Paris et la Seine’ (you read that right; 600 mf’rs in the Paris area alone!). France and Germany are the leaders in ‘local pride’ publications, which are an invaluable source of information. TMIINYS is essential reading; while many of the 146 NY manufacturers have scant information, other brands, like Ner-A-Car, Emblem, Curtiss, etc, have information found nowhere else. Kudos to Geoffrey Stein for his excellent book, which can be purchased here. Motorcycling and Bicycling magazine, 1922-24. A very difficult-to-find publication, and essential for early American motorcycle research. The Complete Illustrated Encyclopedia of American Motorcycling, 1999, Tod Rafferty. Courage Books, Philadelphia. A very useful shorthand guide to 78 American motorcycle manufacturers, with great color photos. Available here. I believe the Gurney family may have had a Ner-a-car late in Dan’s life. Thanks for the road test, I’ve been waiting for it. I find my US Neracar to be a very pleasant ride as well. I’m glad you’ve touched on the lineage from Tooley Patent Bi-Car on through to Vespa and Lambretta scooters. I think it’s telling that the machines to finally succeed as the Motorcycle for Everyman were not designed by motorcyclists and many motorcyclists still refuse to acknowledge scooters as part of the family. 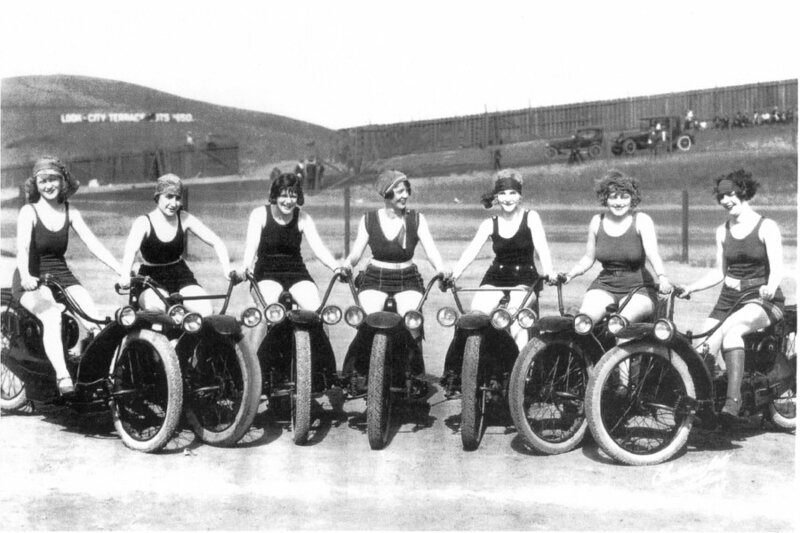 More famous Ner-A-Car owners, in Motorcycling For Women, The Debenham sisters say their first bike was a Ner-A-Car. 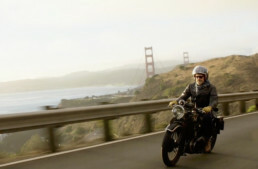 They moved on to more powerful motorcycles within the year. I was pleased to see a Ner-a-Car at the local vintage motorcycle show one year. I was surprised by its small size and variable ratio transmission. Hard to imagine “Cannonball” riding such a sedate machine unless paid to do so. Fantastic photo of you riding it! I enjoyed your piece on the Ner-a-car. I had the chance to ride Doc Batsleer’s around the paddock at Mid-Ohio and it was an amazing treat. What’s the story on the attached? It’s a postcard I got from someone in Paris. On the back, it just says “Moto biplane au Champ-de-Mars. Paris, 1922” On the fuel tank? is written ‘La Jumella’. The Jumella is a mystery! I’ve seen this photo many times; the chassis is clearly similar to the Neracar, but I think the bike is totally unrelated. Even my French experts know nothing about this machine, not even the name of the constructor; it seems to be unique as well. My opinion – it looks like a Neracar but has nothing to do with one, as the chassis is totally different, it must use a different motor, and the seating arrangement is unique – it’s a 3-seater, if you look closely. Amazing. An electric Ner-a-car with modern details could fill the niche between motorcycle and scooter, if there is such a niche. Thanks for the road test and good to read some accurate history recounted, coming from a museum curator like Geoffrey Stein it should be! Your description of riding a Ner-a-car matches the way I describe them, as feeling like a big jelly when pushing them round. Also riding round Montlhery ‘no hands’, my father would do laps at our local race circuit on his bike with his hands on his knees. I believe Jon’s Ner-a-car, an English Model A, is fitted with the later Model B 285cc engine so should have a better performance than with the original 221cc motor. On my bike you can get a slight ‘overdrive’ effect by moving the shift lever past the furthest forward fifth notch into a ‘fifth and a half’ ratio – not what the makers intended I imagine but it works. The photo of the ‘late British model’ is actually of a still born deluxe model with spring frame. A 1925 road test headlines it as ‘Nearer a car than ever’. At least one has survived which the VMCC marque specialist is in the process of resurrecting. And a slight correction (sorry! ), the English Model A and B engines had their carbs in the same place, and even used the same inlet manifold. Thanks for your comments Martin! Wish I’d known about the ‘overdrive’ on the Ner-a-Car when I rode it, the extra speed would have been welcome. I’m curious about change in intake design on the early models – was this not the A/B distinction, or is my research incorrect? I’ve just checked in my father’s book on the Ner-a-car, as far as the engine goes the differences between the English Model A and B were an increase in capacity from 221cc (2.5″ x 2.75″ bore and stroke) to 285cc (70mm x 74mm) so the cylinder is physically bigger, a larger alloy finned exhaust manifold, a detachable cover over the transfer port with intertwined “S”s (for Sheffield SImplex), and an alloy inlet manifold – I think the same shape as that fitted to the Model A which appears to be cast iron. As far as I’m aware the crankcases were mostly unchanged. The fastest speed I’ve seen on my Model A’s cycle speedo was 36.9mph on the run down to Creg-ny-Baa on the Isle of Man TT course. It was surprising how scary that speed could be on a vehicle with minimal brakes!